Lolipop, the Roxy, just over Courtaulds bridge. On 27th Dec 2018 6:51pm, Dougwesley said: . . . There was The Ritz too which I think was also on Foleshill Road further along from the Roxy. (I may be wrong about which was which. I get confused between The Roxy and The Ritz, so my apologies for any error there). 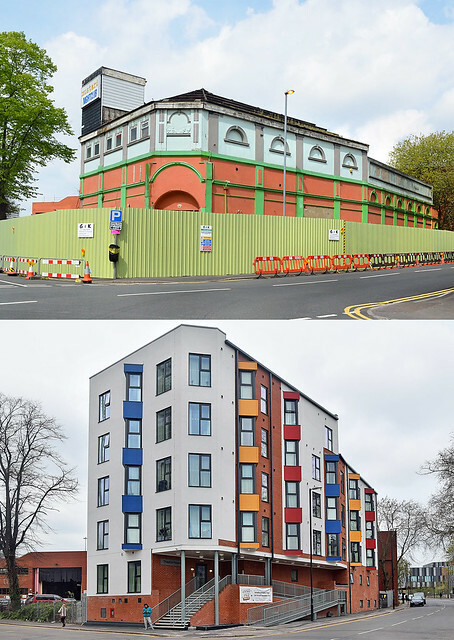 Neither, lolipop - it was The Regal Located in the Foleshill district to the north of the city. The Foleshill Palace was opened on 18th October 1911. It was built for and operated by Charles Orr who went on to operate a small local chain of cinemas in the city. Seating was provided for 450 on a single raked level. It was renamed Grand Picture Palace on 20th December 1911. In 1919 the building was enlarged to seat 900. In 1928 it was enlarged again, and with the addition of a balcony could seat 1,600. A tea room and waiting lounge had also been added, and it had been equipped with a ‘grand organ’. It re-opened still as a silent cinema on 22nd November 1928. In March 1929 it was equipped with a Western Electric(WE) sound system. In 1934 it was re-named Regal Cinema and the screen was brought forward of the stage, reducing the seating capacity to 1,016, and leaving unused 600 seats and the original silent screen painted on the rear wall all hidden from view. In March 1939 it was taken over by Oscar Deutsch and became part of his Odeon Theatres Ltd. chain. The Regal Cinema was closed by the Rank Organisation on 26th November 1960. The auditorium was soon demolished and a workshop was built on the site. The façade was re-modelled, removing the original decorative tiles, and the foyer/front section of the building became a Sketchley dry cleaners. On 29th Dec 2018 2:24pm, Kaga simpson said: Lolipop, the Roxy, just over Courtaulds bridge. Located on the corner of Foleshill Road and Edmund Road. The Redesdale Cinema was opened on 31st January 1933. Seating was provided for 1,073 in the stalls and 500 in the circle. It was built for W.H. Bassett-Green. In 1934 it was leased by the local Philpot chain and was re-named Roxy Cinema. In April 1954, the cinema was taken back by Bassett-Green and it reverted back to its original name. It continued to operate for two more years, and was then closed and the contents were auctioned off on 3rd September 1956. The building was converted into the Bambo Club, then became the Hibernia Club and in 1973 became the Tree Tops Club. It was closed in April 1978, and the building was put up ‘For Sale’. There was talk of conversion back to cinema use with a restaurant, but this came to nothing. A Sikh group purchased the building in November 1979, and it was converted into the Nanaksar Gursikh Temple. I was thinking the other day about the time some schoolfriends and I, all aged about thirteen, decided to meet up and go to the Lyric cinema in Holbrook Lane which was showing the film “The Bridge on the River Kwai” in either 1957 or 58. We had decided to be a bit naughty, and when the introductory music was to be played we would all sing at the tops of our voices a rather rude song about Hitler and his men. I won’t reproduce it here! However, when the music came on we sheepishly looked at one another and not one of us dared to sing. I can remember the words to this day and often have a chuckle about it whenever the film comes on the tv. The Lyric cinema as was is now a very useful shop that sells all kinds of merchandise at very reasonable prices. There was a web page by an organisation called Mercia Cinema with what appeared to be a comprehensive list of cinemas in England & Wales. It only got as far as covering towns beginning A to C, thus fortuitously including Coventry. Although the website is now unavailable, the page has been copied to the internet archive. Coventry is to be found near the bottom of the page. Some have detailed descriptions, histories, even ticket prices. Anne, I wish I had a dollar for every hour my hubby and I had spent in that cinema. Dreamtime. I'm so pleased you posted that, seeing these tragic pictures is like seeing a friend in a car accident, for around 12 years it gave us so much pleasure, warmth, comfort, it helped us become better/closer with friends, it played a big part in my life in Coventry, 30/40 of us on a miserable cold wet Sunday afternoon spread across the cinema, the warmth and feeling between us was part of what Coventry was about to me. Janey - reminds me of the film 'Bridge over the River Kwai'. Well, I knew two soldiers who came back from there. One died from his wounds and bad treatment about five years after his return home, the other one completely closed his mind to those years - he actually has his photo on this forum in a different topic. He burnt all letters, photographs of the last six years he spent out there, and ignored any mention of the period. The bridge still stands today, a few miles inside the border of Thailand, who have control of each side of the Burma river - big tourist attraction, museum, cemetery. There are now houseboats along the river. The episode was a huge disgrace to the civilisation of the human race.